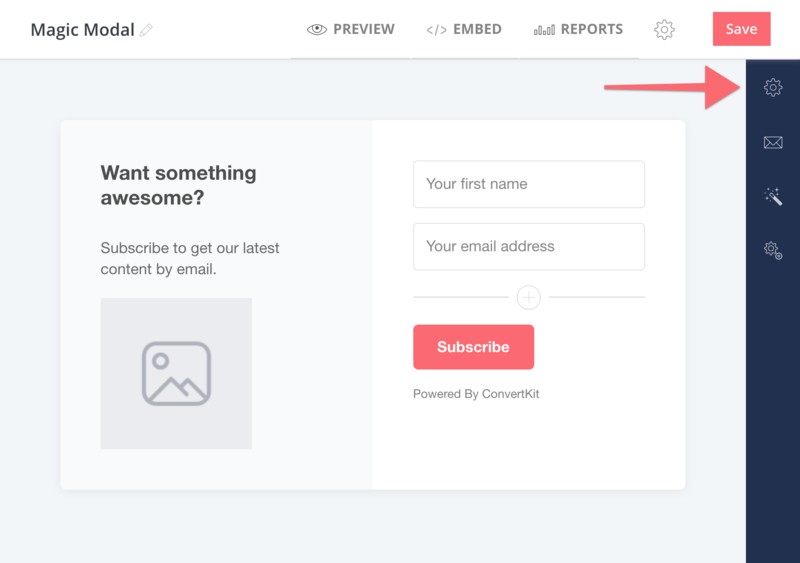 Show a Form to visitors as they are leaving your page! Have you ever seen a really cool offer as you were leaving a website? Are you ready to try one on your site? When you create a new Form, you have the option to set up an Inline or Modal Form. While Inline Forms are great in most cases, Modal Forms capture attention and offer some great features that you can't get with Inline Forms. Want to see how else you can change the Settings in your Modal Form? Check out the Link Click, Timing, and Scroll Percentage features! 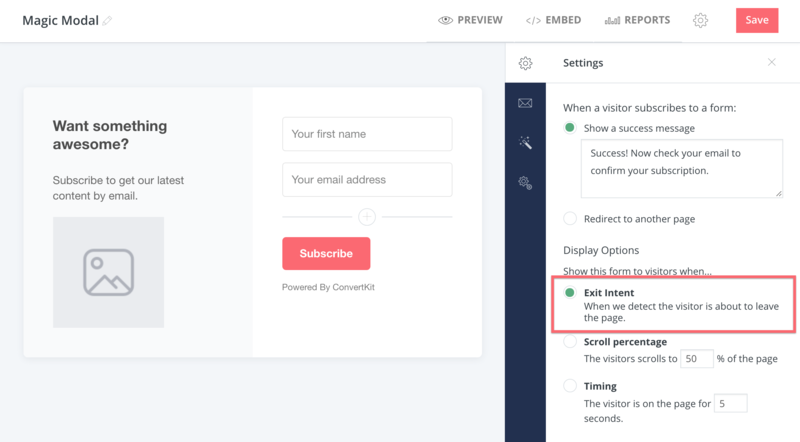 If you want to make an offer to visitors when they're about to leave your site, set your Modal Form to display on exit intent. This option will reveal the Form when a visitor moves their mouse outside of your website. Create a new modal Form. If you haven't done this yet, check out our Beginners Guide to Forms. Select the gear icon in the right sidebar to see your Form Settings. 3. Select "Exit Intent" from the Display Options. Note: Selecting this option will only change the behavior of a Form embedded on your site. The Form Preview will remain the same. 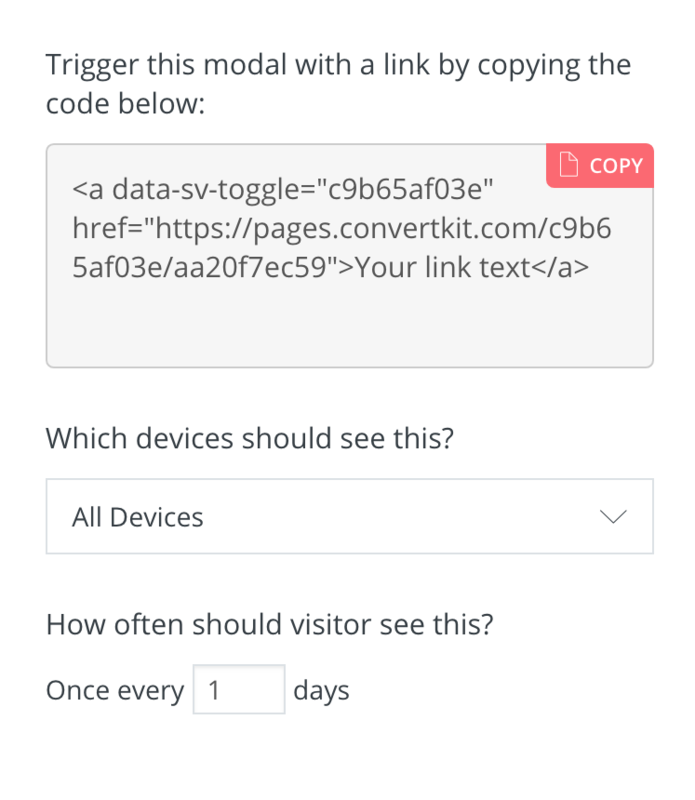 If you'd like to trigger the Modal to display when clicking a link, you'll need this code. "Which devices should see this?" By default, your Modal Form will display on both desktop and mobile sites. But if you'd rather limit the Form to only desktop or mobile, this is the place to do it! "How often should visitor see this?" This option defines how many days will go by before the Form is shown again to a visitor, who's already seen it once before.